The madrigals on Christmas tour in 2016 at Holzer Senior Care. 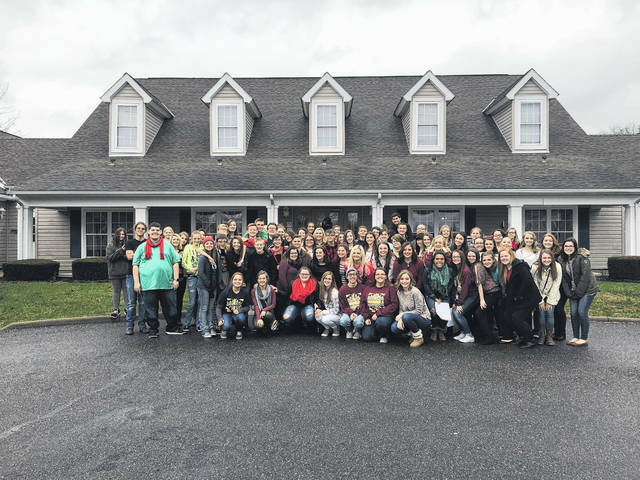 GALLIPOLIS — Gallia Academy Madrigals will be on tour in the community spreading Christmas cheer for several organizations and nursing homes in Gallia County in what has become a bit of a tradition for the group. Performances will be between Dec. 14 and 19 as the group visits several places including Guiding Hand School, Holzer Senior Care, Assisted Living, Holzer Center for Cancer Care and Abbyshire. “The idea behind it is just to give back to the people that have given to us,” said Nattalie Phillips, vocal music director at Gallia Academy High School. Phillips explained that the primary purpose of these trips is for students to gain a new perspective. By going to nursing homes, students are exposed to people living very different lives from themselves, both young and senior. Phillips recalled a story of a Christmas tour several years ago which focused on an elderly woman with Alzheimer’s Disease and her daughter who was a nurse at the home where the senior woman resided. The resident had not spoken in two years. Phillips still remembers the emotional response of all in the room, hearing the woman sing along after remaining silent for two years. Another perspective Phillips hopes students see is the joy of a resident when they get a visitor. One year, the group sang for an older gentleman and the Madrigals were his only visitors that entire year. Phillips’ hope of brightening the holidays for local nursing home residents coincides directly with her intent to broaden her students perspectives. Phillips welcomes invitations to come and sing anywhere. To inquire about having the Madrigals come and perform, she can be reached by email at nattalie.phillips@gc-k12.org or by calling her directly at 740-446-6494. “Anyone that would be interested in scheduling us for a gig, we would love to come out and perform and give back,” said Phillips.